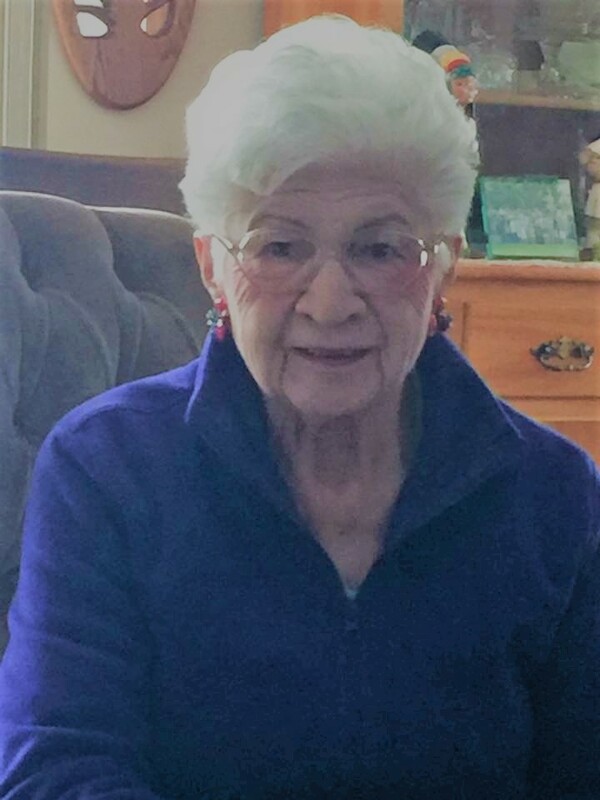 MALTA-Doris Kirkaldie Nicholson peacefully joined her creator on February 9, 2019 at the age of 92, in Billings, MT. She was born on January 31, 1927 to Robert and Dora Kirkaldie, south of Dodson, and was one of eight children. Doris’ life was guided by her love for the Lord and was filled with family, friends, and active community involvement. She was an energetic community volunteer and spent years caring for seniors in the community and serving those at the Hi-Line Retirement Center. Doris was a dedicated member of the CowBelles, including chairing numerous events. Her faith and roles in supporting the Catholic Church grew throughout the years. She loved to travel and was always ready to go...whether a drive to Havre or a trip to Hawaii, but Montana owned her heart. Doris loved making crafts, painting, quilting, although sewing was her special passion. She was an avid basketball fan. She was an amazing cook and baker. Her green thumb was evident inside and out of her home. Throughout her life, she enjoyed acquiring numerous collections, including Black Angus cows and her special antique collection. Doris was preceded in death by all seven siblings, her husband Dan Nicholson (2001), son Richard Overberg (2009), and step-son Daniel Nicholson. She is survived by son Karole (Judy) Overberg, Lake Havasu, AZ, Barbara Downs, Billings, MT, Dana (James) Bledsoe, Winter Park, FL, Debbie Nicholson, Draper, UT, daughter-in-law Cleo Overberg, Buffalo, WY, and step daughter-in-law Helen Nicholson, Minneapolis, MN. Grandchildren Jason Downs, Billings, MT, Jamilyn (JD) Redding, Tualatin, OR, Chris (Trinity) Legg, Great Falls, MT, Mike (Raina) Overberg, Clarkston, WA, Brad (Summer) Overberg, Clarkston, WA, Karolen (Matthew) LaRose, Franklin, TN, Troy Overberg and Tracie (Ben) Kirvin, Buffalo, WY, Olivia Bledsoe and Nicholson Bledsoe, Winter Park, FL, Sophia Crowder, Draper, UT, and step-grandchildren Anne (Russell) Vossbrink, Scottsdale, AZ and Danny Nicholson, WI. She had numerous great-grandchildren, as well as countless nieces and nephews. She will be missed by all as we live out her legacy. Doris was a wonderful person; I got to know her through Cowbelles, now Cattlewoman and did many projects together. She will be missed greatly as she left behind so many memories. I'm so glad to say we share a special granddaughter, Sophia, together. May God wrap his arms around you and comfort you all. She will missed by all of you but you all carry such great memories of a great lady. There was nothing better than a cup of coffee at Doris'. I loved her giggle and explorations to the basement to view her latest project - I certainly didn't do it often enough. She led the way at church, spiritually and in the kitchen. God bless her family, thank you for sharing her with us. We really planned to be at her service but ended up snowed in. We have so many great memories of Doris and Dan from all the years past. Always smiling, loved her giggle, checking out new sewing projects that amazed me. Being a big part of promoting Angus cattle. Seemed like she loved everyone. A great lady--she will be missed. Our love and sympathy to each of you. I became friends with Doris many years ago when she, Madelyn and I decorated the church for several years. She just had that artistic talent was was a joy to work with. I loved having tea or coffee with her in her warm inviting kitchen, always with a tour of her latest craft or project. Those memories will always hold a special place in my heart. I’m sorry I wasn’t able to be at her service. This snow prevented me from getting out of my driveway. My thoughts were with you all throughout the day. I am sorry for your loss. Doris and I worked together at the Malta Hospital years ago. She was always cheerful, brightened up every room.